Loft also has a table and television with DVD/VHS. 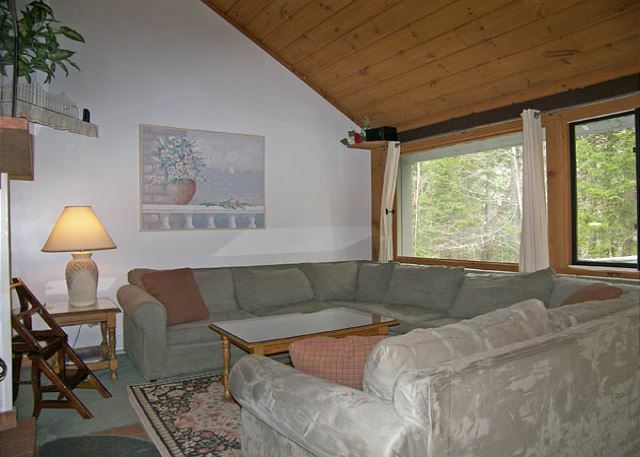 Get away to the White Mountains at this Village of Loon townhouse. The entry level of this townhouse offers a bedroom with a queen bed and a full bath just outside the bedroom door. Downstairs is the master bedroom suite with king size bed, 22" flat screen television, private bath and an enclosed deck to a small yard space. 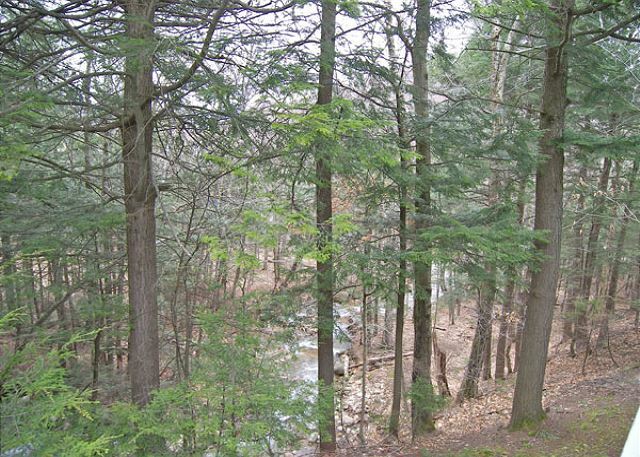 Beyond the yard space there is a steep slope with a brook just below. 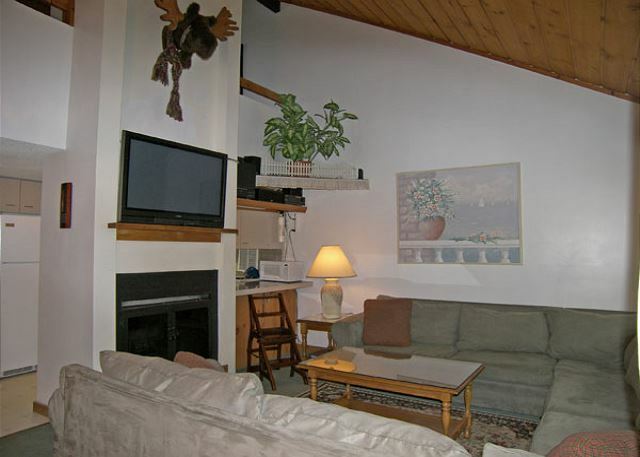 The main living level is above the entry level and holds the full kitchen with microwave and dishwasher, dining area with seating for eight and the living area with a large u-shaped couch, flat screen television and wood burning fireplace. 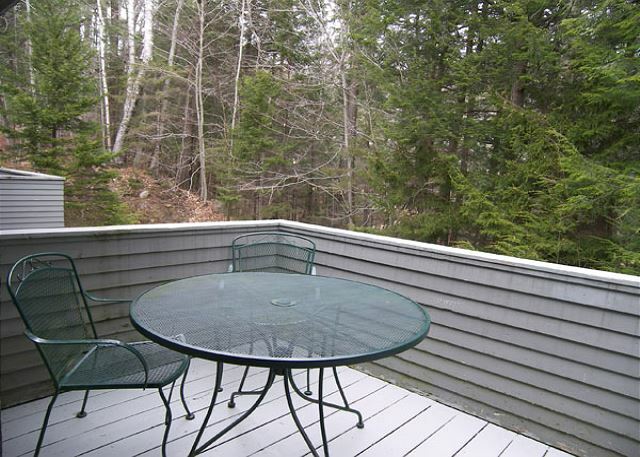 The deck is accessed from a slider in the dining area and offers a wooded view with the brook below. 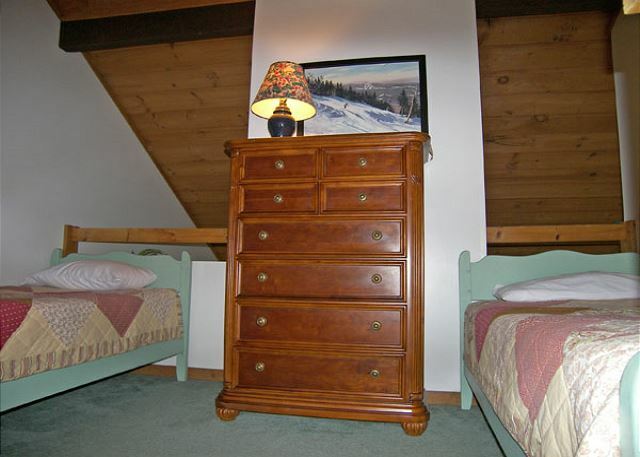 The top-most level of the townhouse has the sleeping loft with a set of bunk beds at the top of the stairs, a television with DVD/VHS and two twin beds located in the upper loft area. You stay includes membership in the Village Swim, Tennis and Fitness Club with two indoor pools, two outdoor pools, four Jacuzzis (one outdoors), sauna, exercise room and 12 tennis courts for your enjoyment. We knew that there was no a.c. But, on a hot and muggy evening, we would have liked to open the patio door. Unfortunately, the screen had holes in it and, in any case, the screen did not stay on the slider. We were left with a choice of bugs or fresh air. The patio could also have been a bit cleaner. Great relaxing 3 day weekend with my 16 and 20 yr old sons before start of school. 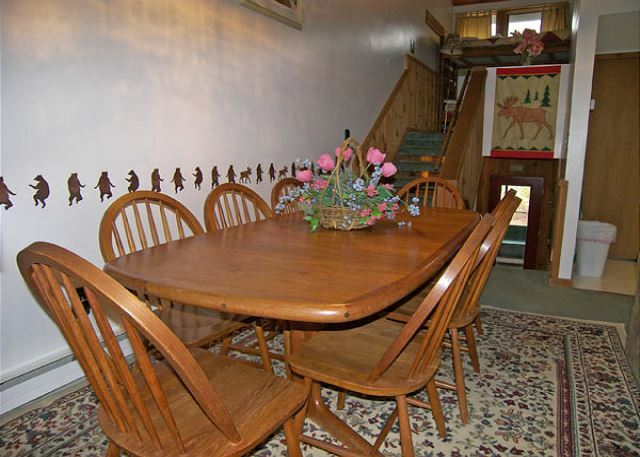 Older home, but had plenty of room and all updated amenities. We loved river right outside our deck. Great evenings playing board games out there. And I'm probably nitpicking to find things to write. There were a few minor thing wrong. But nothing worth complaining about. I would recommend getting one with a AC or bringing some fans. The pools and hot tub were awesome the game room is nice the tennis courts look good and the scenery was beautiful. It is about a mile or two away from town which is great.